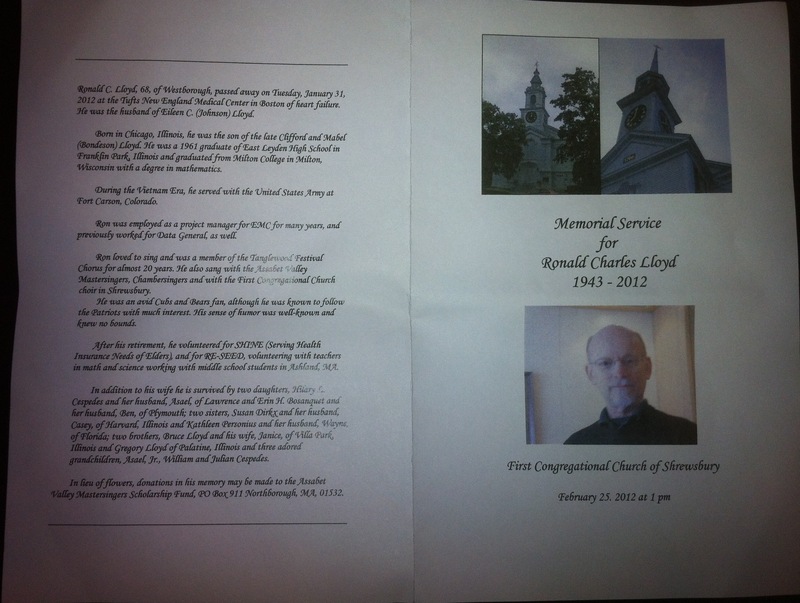 Today I attended the an amazing memorial for a friend and former coworker, Ron Lloyd. I had the pleasure of working with Ron for a decade at EMC. When I started at the company in Product Management, Ron was my most valuable resource for understanding the technology and culture of the storage industry. While I would regularly call on his knowledge and connections for many projects, it was his unfailing positive outlook and wicked sense of humor that made him a great friend. His passions of music, science and sports made for great lunchtime conversations. Ron showed me that it was possible to have a good work/life balance. He was active singing in the Tanglewood Festival Chorus and with the Boston Pops. I saw a beautiful Brahms performance (see Nanie, Opus 82 below) at Tanglewood and went to the Pops holiday concert a couple of times. His memorial service fit Ron, a mix of humor (a George Carlin reading and stories from friends and family) and music (amazing live singing from the Tanglewood Festival Chorus and Assabet Valley Mastersingers). Despite having a serious heart condition for the last 25+ years of his life, Ron was fearless. A story that I shared at his memorial was that a few years ago, Ron and I were at Universal Studios for EMC World. We went on The Hulk, one of the fastest and best steel coasters. Before we went on, I asked Ron if his heart would be OK and he just laughed. While many riders come staggering off the coaster a bit wobbly, Ron just turned to me and said “the restraint was a little tight against my pacemaker, but let’s go again”. Ron was a great friend who I shared some great times with (we went to the Superbowl together) and introduced me to some great music. I was so impressed that in his retirement over the last two years, in addition to spending time with his grandsons, he volunteered teaching science and math (with the Boston RE-SEED Center). He lived life to the fullest and those who spent time with him would always be more knowledgeable and happier. You are currently browsing the Blog Stu - Stuart Miniman blog archives for February, 2012.